Swagman 64720 Upright locking bike racks for car and truck roof rack mounting. Locking up right roof mounted bike racks, car top bicycle carriers, bike tray 64720. - Each locking roof rack bike attachment holds one (1) bike. - Now fits up to 3-1/2"inch wide factory roof rack cross rails. Fits all Thule, Yakima and similar roof rack systems. mounting bracket protect your bike's finish. bike carrier channel. Folds down when not in use. The 64720 roof mounted bike rack is the best value roof mounted bike rack that we offer. This roof bike rack includes a locking knob that allows you to lock the bike into the rack. 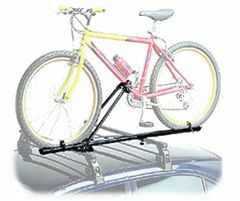 The 64720 roof rack mounted bike racks also attach to most factory roof racks with crossbars that are under 3-1/2" in width.